Yay! Today my Supermicro SYS-5028D-TN4T servers arrived which will make up my home lab along with the Cisco SG300-20 switch. The microservers pack one hell of a punch, let me give you some quick specs. OK now we’ve got that fist bit out of the way how about some pictures? Behold the server in all it’s glory! Here we see the unit with the front door open revealing the 4 hot swap drive cages, air inlet and the power/reset buttons and 2 USB ports. The front door is lockable for security. Next we have one of the drive cages removed. The maroon button depresses and the release leaver springs out so you can remove the drive and cage. I’ve removed all the hot swap drive cages so we can get a better view of the inside. 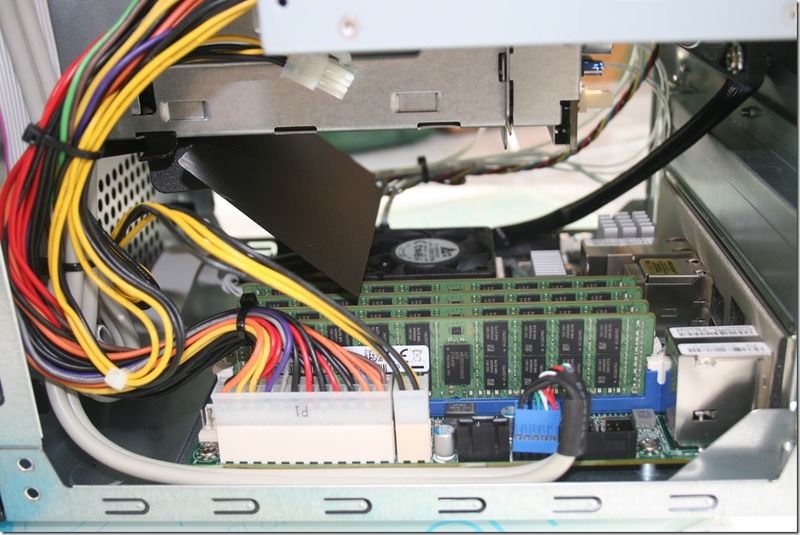 The drives connect to a midplane which has connectivity internally to the motherboard. Here we can see the rear of the unit. A large fan provides cooling for the unit and next to it we see the power connector. Below we have the motherboard IO connectors. If we start at the left we have two USB3 ports with the dedicated IPMI connection above them. Moving right we first have the two 1Gb network ports and then the two 10Gb network ports. Finally we have a traditional VGA port. Now for a look at the internals. The chassis cover is removed fairly easily – there are 4 thumbscrews located around the back of the unit and a small locking mechanism latch denoted by the blue lever on the right of unit. Once these are removed the chassis comes off and we can get our first look inside. With the cover removed we can see the top of the unit has space for a 2.5 inch disk drive – this would be a good place for a solid state drive (SSD) as we don’t have to worry about vibration transferring to the case and generating noise. It’s great to see that the cabling for this drive has already been routed here. You can also clearly see the large exhaust fan on the rear of the case. Next we can see the midplane which connects the hot swap drive bays to the motherboard. Again the data and power connections are already wired in. This side view gives a fairly good luck at the motherboard. Again we can see the midplane and it’s connections to the motherboard. 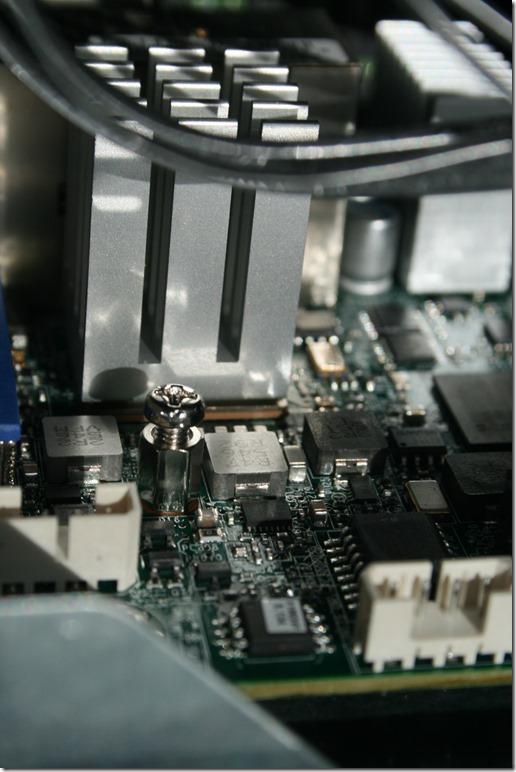 The PCIe slot is visible along the edge of the motherboard (the long black slot). It should be noted that space is a premium in this chassis so you will need to carefully check the dimensions of any card you are thinking of installing. It isn’t the easiest thing to see but if you look carefully there is a piece of black plastic at an angle below the drive cages – this acts as a baffle to direct airflow over the motherboard. The CPU fan is just visible and at the back we have the DDR4 memory modules. Now we get a close up view of the ASPEED chip which provides the IPMI functionality. If you look to the right of it you will see the M.2 connector which provides high speed access to flash media M.2 cards. Let’s look at installing the Samsung M.2 module I purchased separately. First we need to remove a small screw which secures the M.2 card when it is installed. Now I have to say this is a fiddly job but as long as you are careful and have a screwdriver small enough to get in it’s not too bad. We remove the screw completely as the M.2 won’t fit otherwise. Next the M.2 card is slide carefully into the socket – as with RAM modules the module is ‘keyed’ so it will only go in one way. Once inserted gently hold the module down and replace the retaining screw. Getting this bit done is also ‘fun’ but again with a little patience it isn’t too hard. Here we see the M.2 module secured. One thing to note is that there isn’t much space around the module. The heatsink on the left of the picture is practically touching so there is a likelihood of thermal transfer especially when you consider these M.2 modules can get rather toasty under load. This is definitely something I will keep an eye on though at this point I’m not sure how best to do so without a FLIR camera. OK now let us take a look from the other side of the chassis. We can see the power supply connection to the motherboard along with the four 32GB DDR4 ECC RAM modules. The airflow baffle is also easier to see in this picture. I am curious how well the unit will cool itself. I’ve already considered getting a small hopefully silent fan for the front to increase the airflow, especially if I can get it moving across the M.2 module as I imagine it might get warm when I drive a lot of work through it. Here we have the two units setup with the switch. I’m going to get some cables of various lengths to neaten things up and let me position the switch exactly the way I need to on top of the servers. Right now I have the IPMI ports and the 1Gb ports connected into the switch. The two 10Gb ports on the servers are connected directly into each other as I will be using those for virtual machine migration and storage traffic. Much as I would love a 10Gb switch it’s just not something I need and you don’t see any passively cooled so that would just mean more noise. Well it’s safe to say I am really excited with my new lab equipment – right now I need to sort the network cables and get some additional storage. My hope is I can get some more solid state capacity in these and some traditional spinning disks. At that point I’ll look to start playing around with the various hyper-converged platforms available, things like VSAN, Nutanix, Microsoft Storage Spaces Direct and no doubt others. Maybe if I am very lucky there will be old equipment from work I can save from the scrap heap or perhaps some generous company will loan or gift me some in exchange for reviews. Who knows but suffice to say this kit will provide me with a high performance lab lasting many years. If you’ve got this far then thank you for reading I hope you enjoyed this first look and get ready for more articles on my lab in the near future!